(With National Engineers Week (February 18-24) coming up, I can’t help but think about the important roles engineers play in Wisconsin. It is relatively “easy” to design structures that will withstand external loads or roads that will carry their intended traffic. The engineering challenge is to do this while also meeting other important constraints like budgets, schedules, environmental impacts, inconveniences to existing users, and sustainability. Engineers truly are the unsung heroes of our modern age. They have had a hand in the design and maintenance of so many aspects of our lives from roadways and recreational trails to airports and structural building design. Many things we often take for granted, like drinking water systems, sewers, wastewater treatment plants, and landfills, are all designed by civil engineers. As our infrastructure ages and there is dire need to repair, upgrade, and replace, there are numerous worthy areas competing for investments. Engineer’s do not shy away from the challenge of doing more with less, that is often what inspires us. We’re also constantly looking for new, better ways to build things. For example, engineering companies in Wisconsin are working on state of the art renewable energy projects as well as innovative new pavement preservation and rehabilitation techniques for our roadways. As our world gets more complex and resources become tighter the need will only increase for innovative and creative people to pursue science, technology, engineering and mathematics (STEM) careers. What we really need are individuals that rise to a challenge, who care about the environment and the world they live in, and want to make a difference. We need more heroes. National Engineers Week is a great time to recruit these new engineering heroes and introduce middle and high school students to our profession. As part of Engineer’s Week, don’t forget that February 22nd is also introduce a girl to engineering day! 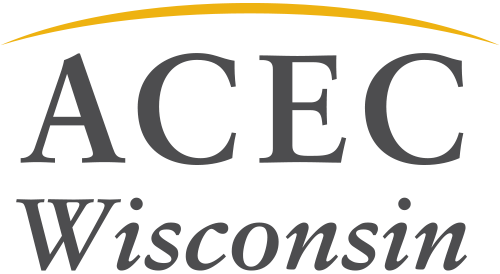 For more examples of engineering innovation in Wisconsin, ACEC Wisconsin will once again be announcing our annual Engineering Excellence Awards during Engineers Week. These award-winning examples of engineering at its finest will be featured in this blog series. Bill Holder is Vice President of American Engineering Testing (AET), a geo-technical engineering, environmental, forensic, and construction materials testing firm with offices across Wisconsin, Minnesota, North Dakota, South Dakota, and Wyoming. We work on projects across numerous markets including energy, transportation, agriculture, commercial, government, industrial, and telecommunications. 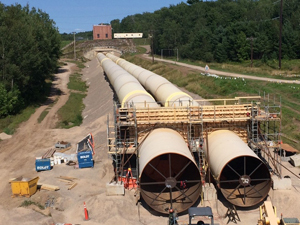 AET provided non-destructive testing services on the Grandfather Falls Hydroelectric Penstock Replacement project (photo above).